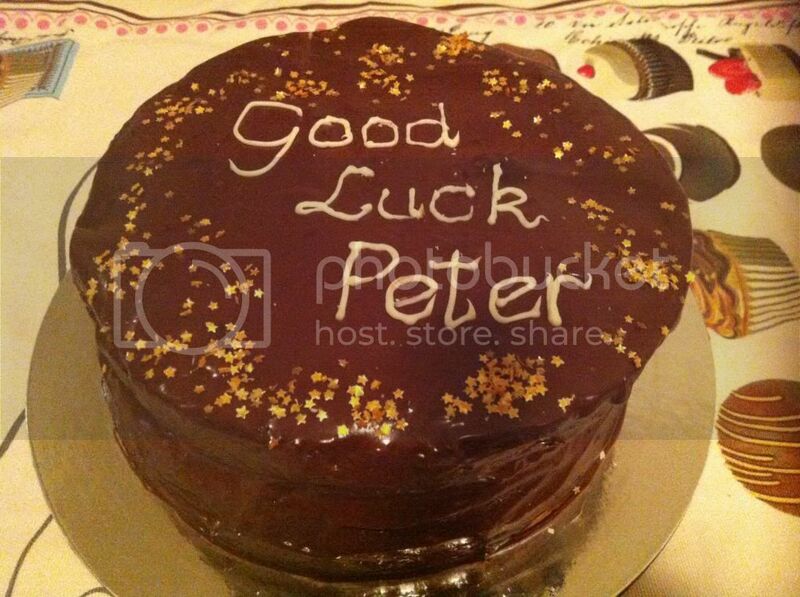 One of our colleagues, Peter, finished up on Friday. He has been an admirer of my baked goods, so I couldn't let the occasion go by without a cake in his honour. Knowing that chocolate is generally a favourite, I decided to make a chocolate cake, and I couldn't go past the Fabulous Chocolate Celebration Cake recipe by Barbara Broccoli at p231 of Share: The Cookbook That Celebrates Our Common Humanity. Barbara is the producer of several James Bond films. Preheat your oven to 180 degrees Celsius. Grease and line 2 cake tins, each 20cm in diameter. Break the chocolate for the cake into pieces, place into a heatproof bowl with the milk and melt over simmering hot water, stirring from time to time. In the bowl of a stand mixer, beat together the butter and sugar until creamy and light. Add the eggs, flour, baking powder and almond meal and combine either on low speed in the mixer or using a rubber spatula. Add the melted chocolate and combine well. Divide the batter evenly between the two cake tins, smooth off the tops, and bake in the preheated oven for ~30 minutes or until cooked through. Unmould the cakes onto a wire rack to cool completely. For the ganache, heat the cream in a small saucepan on the stovetop until it is just boiling, then remove from the heat. Stir in the chopped chocolate until smooth. Place the ganache into the fridge to firm up for an hour or so until it thickens up and is spreadable. 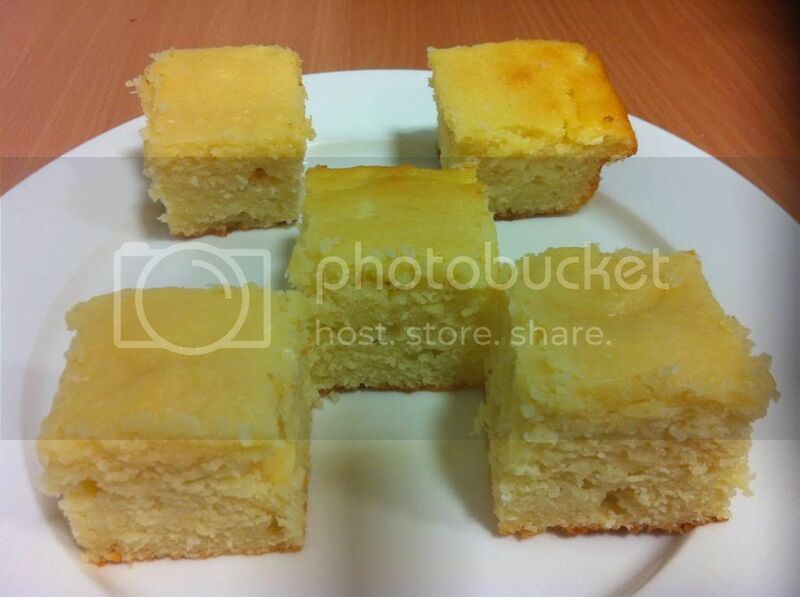 To assemble the cake, place the bottom cake onto a cake board or serving plate. Spread one third of the ganache over the top of the cake. Place the second cake on top of the first, and spread the entire top and sides of the cakes with ganache. Decorate as desired. This was huge - bread roll, filled to the brim with spicy pulled pork, with lettuce, pickle, tomato, onion, coleslaw and mayo. The bread roll was not as good as it might be (the ones at Roll'd are better), but I could not fault the filling. The only thing is that as a personal preference, I would have liked less mayo, as it left a greasy taste and texture in my mouth all afternoon. The staff were friendly, and service was reasonably fast - but it seemed to be faster if you had take-out rather than eating in. After work, I caught up with Tim for drinks at our fave, Zuffas, in Little Collins Street - only to find out it was last drinks at Zuffas forever. Their lease is expiring, so we will have to find ourselves a new watering hole. We liked Zuffas because it was reasonably quiet and we could always get in. 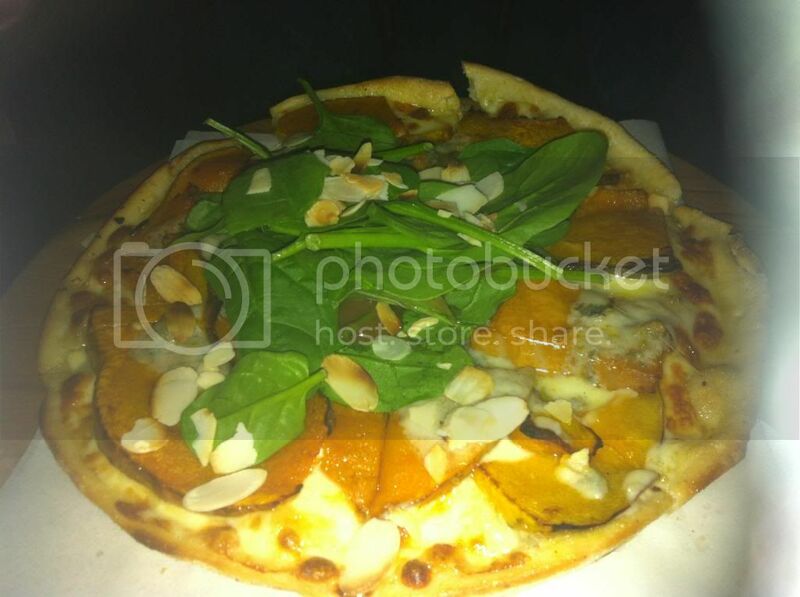 Both pizzas were delish, but the pumpkin one with its sweet roasted pumpkin, crunchy almonds and sharp gorgonzola was my favourite. "Everybody's got a law degree these days; they're like iPods." This tickled my fancy because I am a lawyer - or perhaps I just have an odd sense of humour. So what has this got to do with my phone? After reciting this quote from Clegg, I wanted to find a Youtube clip of his voice for Tim, because actor Lachy Hulme (Clegg's alter ego) gives Martin Clegg the most peculiar accent for comedic effect. That was when I realised - my mobile phone was not in my handbag!!!! Luckily, I knew exactly where I had the phone last, so I sculled my coffee (it wasn't hot so that was easy), and Tim and I flew back to Diksteins, with me not being very hopeful that my phone would still be there. However, it was my lucky day, and my phone was on the floor against a wall under the table where we had sat, and the same ladies who took our table when we left were still there. You could not wipe the smile off my dial when I found that my phone was still there. Phew! Sooo ... I only realised I had lost my phone so quickly because of Dr Martin Clegg. I will therefore be eternally grateful to the fictitious Dr Clegg. This week's French Friday with Dorie challenge was educational - the dish is Socca from Vieux Nice. I have never heard of Socca before, but for those like me who have never heard of it before, it is a chickpea flour pancake. The other educational aspects of making this dish is (a) finding out where to buy chickpea flour; and (b) finding out that in Australia, chickpea flour is sold as besan flour. Whew! All that learning in one simple dish. 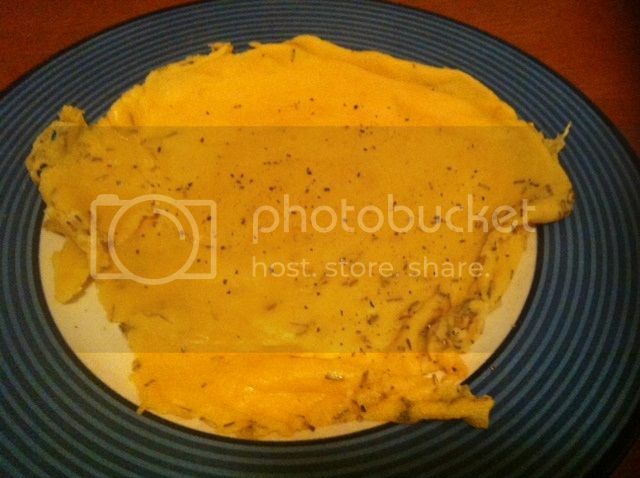 I really didn't know what I'd think about this dish. It is very simple - flour, water, oil, rosemary. However, I was pleasantly surprised - it was really tasty eaten on its own while still warm. I only made a half recipe, which turned out the perfect thickness in my pan, but unfortunately made it a little delicate, but made it hard to get out of the pan in one piece, hence the mangled appearance. I'd make this again - which is lucky, as I have a whole bag of very pricey chickpea flour. Have you ever got caught up in the hype of something and been desperate to try it because everyone else in the whole world except you seems to have tried it and deemed it good? At the moment, the "in" thing is cronuts - every other day there is an article in the newspaper or a TV story about cronuts. Apparently, there is even a black market for cronuts. If I decide that I really have to try a cronut, I will skip the black market and make my own. It's hard to explain what crack pie is like, but unchilled, it really is like pecan pie without the pecans (as someone else suggested), and chilled, it is like caramel fudge pie. The pie has an oat cookie crust that melds into a brown sugar toffee-like substance when the pie is filled and baked, and the filling really does taste like caramel fudge. I almost didn't make this because milk powder here costs a squillion and the smallest bag you can buy is 1kg (what ever happened to small cans of Sunshine Milk Powder?) when all I needed was a tablespoon to make the pie, but I relented on the basis that as the cost of a crack pie is $44 from Momofuku, I am still ahead. And the verdict? I liked this pie - in fact I liked it better warm than chilled (which is how it is meant to be served). However, I haven't developed an addiction to it - I prefer good old fashioned caramel tart. To see what the other Daring Bakers made this month, you can take a look at the slide show on the Daring Bakers website on the 27th, US East Coast time. For this week's Wednesday with Donna Hay, Chaya has chosen Apple and Dark Chocolate Wontons from Donna's website. 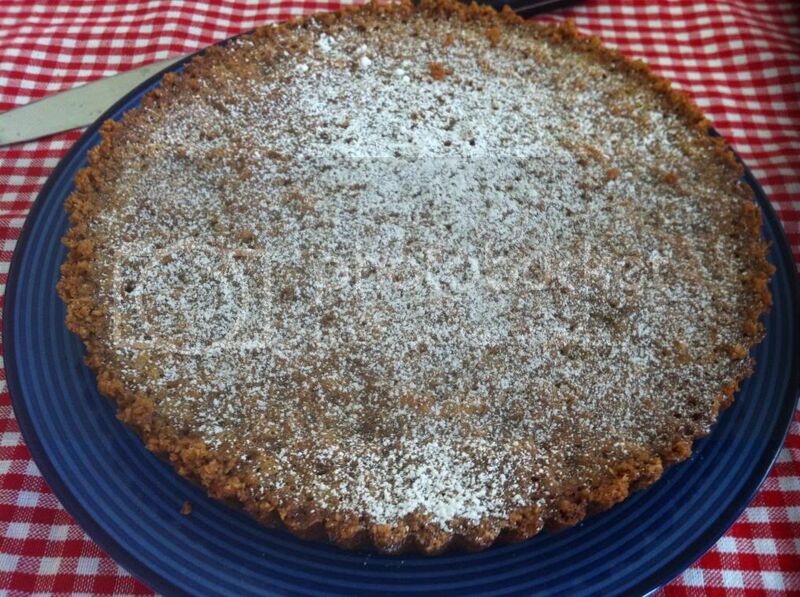 Dust the finished product with icing sugar to serve. These wontons tasted nice - crispy on the outside, soft and gooey chocolate contrasting with the tartness of the apple on the inside. It was my first time working with wonton wrappers. I have heaps of them left over, so I hope to make some pot stickers with the remainder. Over the weekend just past, Tim and I went to Echuca-Moama. Echuca is on the Victoria side of the border, and Moama is on the New South Wales side of the border. Both towns are set on the banks of the Murray River. Echuca means "meeting of the waters", and you may know it from the eighties TV mini-series All the Rivers Run. The weekend weather was crisp and cold in the mornings and evenings, giving rise to beautiful clear, warm days. This foccacia is served toasted and is outrageously good, with two of my favourite things - chutney and pumpkin. The custard in this slice was perfectly light, fresh and tasty, but I would have liked the pastry to be slightly flakier. He approved wholeheartedly of both. I also bought the Secrets of the Beechworth Bakery cookbook ($24.95) so I could take a slice of the bakery home with me. Watch this space as I try out some of their recipes. I like the philosophy of Tom O'Toole, founder of the Beechworth Bakery - keep it simple, and keep it fresh. He also has no problems with sharing his recipes in the book, because as he says, he has pinched ideas from all over the place over the years, and he believes that ideas are to be shared. Isn't that so true with recipes - all of them are derivative of what someone else has done before in some way. If you are near a Beechworth Bakery in your travels and love old-fashioned, "from scratch" baked goods, do drop in - it's definitely worth the visit. My colleague, Linda, asked me to make 36 cupcakes for her grand daughter's birthday party. The party is princess themed, and Linda wanted the icing to be ruffled just like this, with 12 cupcakes each in light pink, light blue and light yellow. I know that Linda likes the Crabapple Bakery Vanilla Daisy Cupcake recipe, so that is what I used for the base cakes. It's an old reliable that yields consistent results and tastes good. I was glad of that, because as part of the cake is left bare by the ruffled icing technique the cakes need to look good! For the buttercream, I used the Primrose Bakery Vanilla Buttercream icing recipe for its taste and consistency. 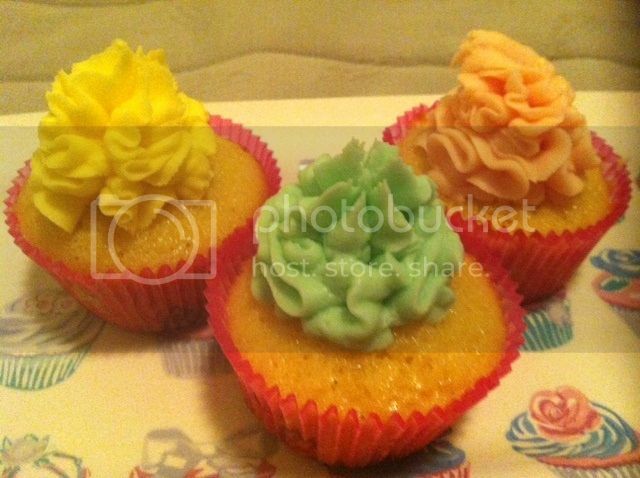 (Ignore the photo of the icing in the article - it looks nothing like the actual icing, and I suspect that the photo is just a stock photo of cupcakes bunged into the article.) The trick is to ensure that the icing is stiff enough to stand up and hold its shape once piped. For the colours, I used liquid colouring, added a drop at a time, for the pink and blue icing, and gel colouring (because I didn't have yellow liquid colouring!) for the yellow icing. The technique for the ruffled icing is shown in this video on Youtube. I did order ribbon to make the princess flags on 3 June from an Australian supplier, but it is yet to arrive - so no flags. However, I did find Multix pink princess cupcake papers in the supermarket (Woolworths came through for once!). 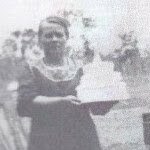 There is going to be some maxing out on sugar at Linda's party, as there is 1 1/2 kilos of icing sugar in the icing for the 36 cakes - yikes! But as Linda says, the kids just eat the icing off the cake and the cake gets abandoned, so maximum icing is the way to go. It's Friday again, and that means French Friday with Dorie. This week's recipe is Sable Breton Galette with Berries. However, Dorie's Bon Idee is to turn the galette into cookies by adding a bit more flour and adding two egg yolks instead of one whole egg to the mixture. As cookies are more portable and I wanted to take the dish to work, the cookie suggestion was perfect. 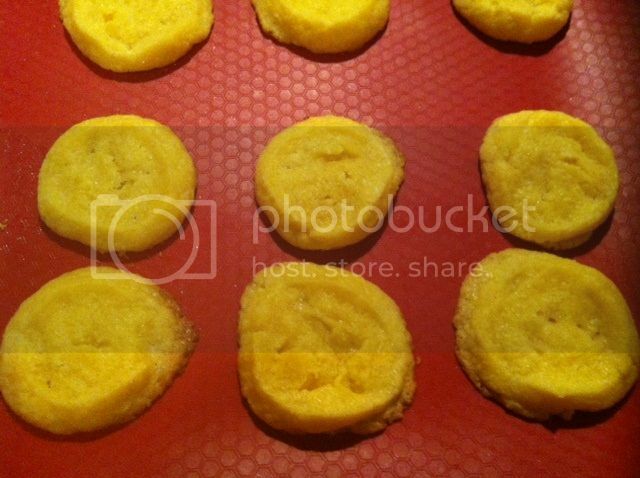 I used the slice and bake method for my cookies - why make life harder by rolling out the dough? These cookies may not win any beauty contest, but they taste fantastic - crisp and buttery, and not trying too hard for attention. To see whether the other Doristas made galette or cookies and what they thought about it, visit the LYL section of the website. This week's Wednesday with Donna Hay pick comes from Margaret, who chose Mushrooms with Pasta from p22 of Off the Shelf. 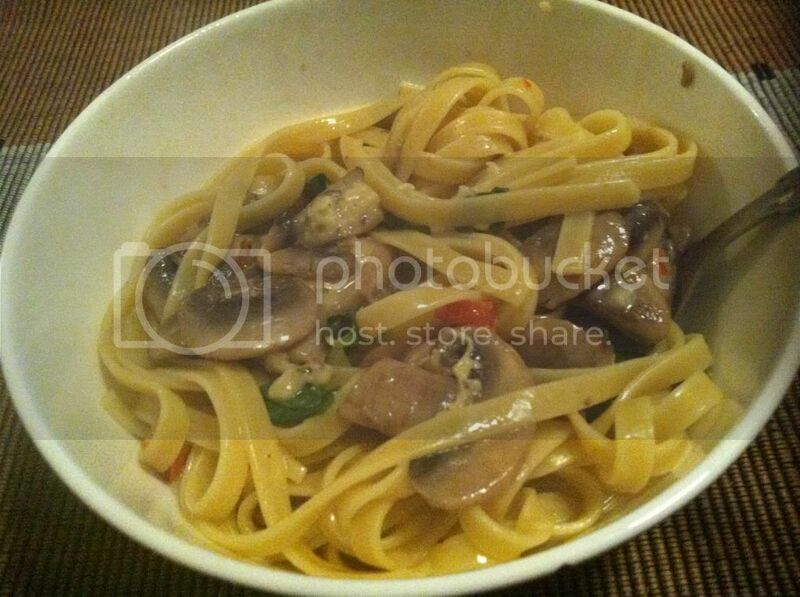 This dish involves making a creamy mushroom sauce with stock, chilli, basil and cheese to coat fettucine. I thought this was really quite nice. I cut down the pasta from 400g to 250g and made the whole amount of sauce, which gave me three hearty serves of pasta. It was another quick, easy, tasty dish. I even bought pre-cut mushrooms to cut down in preparation time. To see what Margaret, Kayte and Chaya thought, visit their websites. And if you want to cook along with us each week, feel free to join us - just contact one of us to let us know, and we will add you to our mailing list. Congratulations to Harrison Craig from Melbourne who was announced last night as The Voice Australia for 2013. Harrison has a voice that is smooth like honey and deep and rich like chocolate, which is especially wonderful because he has a stutter in his speaking voice and is only 18 years old. He is marvellous - I'll be watching this space for Harrison's next career move. 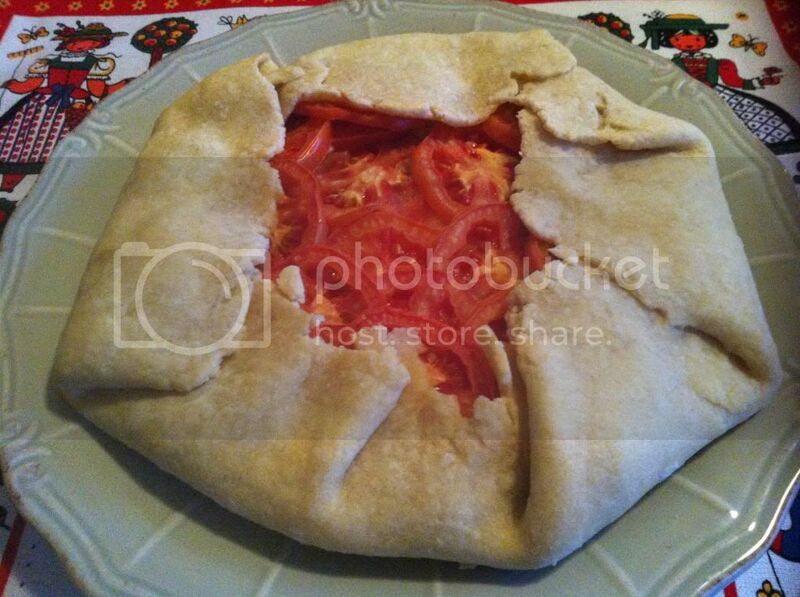 This week for Baking with Julia, we take a walk on the savoury side, and make Cheese and Tomato Galette. For the uninitiated, a galette is a free form pie. 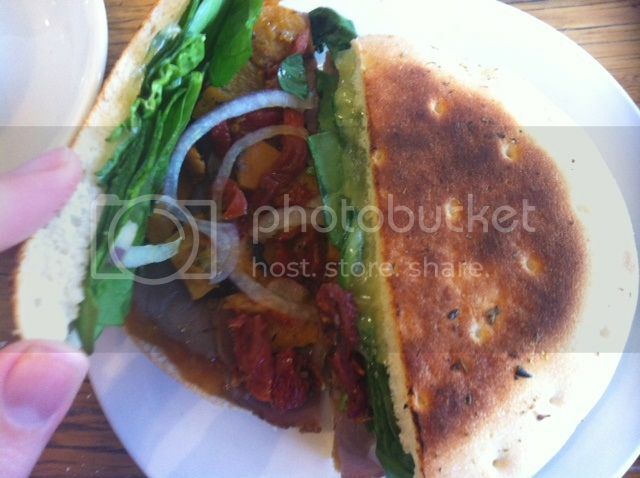 This one is made with sour cream dough, and contains cheese, tomato and basil. I used low fat tasty cheddar cheese, as I refused to buy any extra cheese - I am not a huge cheese eater, and it is rather wasteful to throw out cheese that has gone mouldy or hard from lengthy periods spent languishing in the fridge. I added salt to the filling and sprinkled it on top of the dough because I thought that it needed it. I took this to work, and much to my surprise, it disappeared. Lovely Lisa even complimented me on it in the lift going home - yet I was worried that no-one would want it because the dough was below par as I made a boo boo when halving the recipe and ended up having to add way more flour than was desirable. I am happy that people liked it anyway. 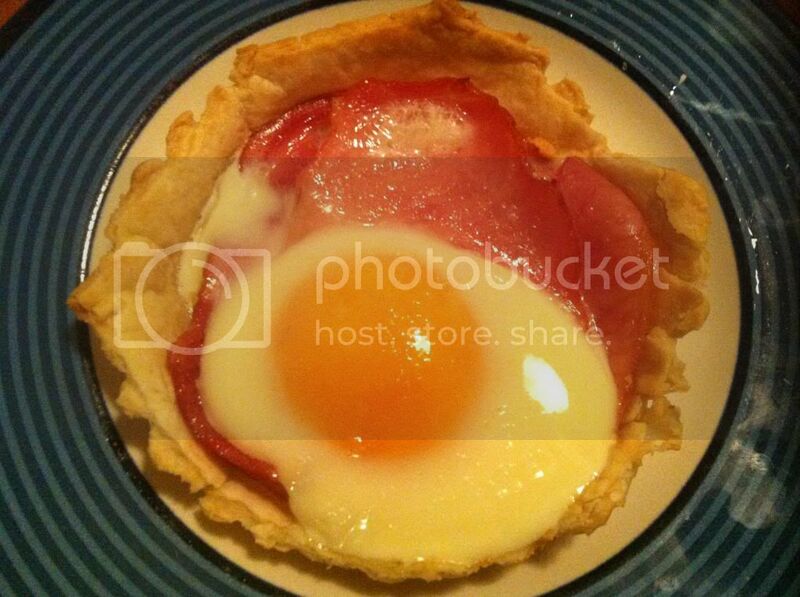 To see what our other merry members of BWJ thought of this galette, visit the LYL section of the website. I came into her room half an hour before the bridal dinner, and found her lying on her bed as lovely as the June night in her flowered dress — and as drunk as a monkey. She had a bottle of Sauterne in one hand and a letter in the other. A couple of weekends ago, my family and I went on a day trip to Stanthorpe in Queensland. Stanthorpe is a rich fruit and wine area, so we were looking forward to a day of great eating (which indeed transpired). At the cafe where we ate lunch, they sold a wide variety of locally made alcohol. I bought a bottle of Sauternes, a sweet dessert wine, having confused it with Calvados, an apple brandy, because of the apple on the label. I was a little disappointed when I discovered my mistake, as I had wanted to cook with Calvados. However, a trusty Google search later, I found that there were plenty of recipes using Sauternes as a component. We were back in business. The recipe that particularly caught my eye was a one for Olive Oil and Sauternes Cake by Neil Perry, a famous Australian chef. He served his cake with roasted pears, but as I did not have any pears, I made the cake by itself. It is a plain but moist affair, and I can see why it would be a perfect vehicle for roasted fruit and syrup or poached fruit, as it would soak it up like a good bread with pasta sauce or rice with a curry. Despite the non-obstrusive nature of this cake, it was popular at work and was gone in a flash. The next day, a lovely girl whom I don't know ( but who clearly knows who I am!) complimented me on that cake. I love getting feedback, so I was very pleased that this cake was a quiet achiever. It's French Fridays with Dorie time, and this week's recipe is Back-of-the-Card Cheese and Olive Bread. Why? Because the recipe was off card provided by a cheesemaker. I was sceptical about this one, especially as it is an unyeasted loaf. However, I needn't have worried - it was absolutely delicious. I am not normally a fan of savoury cakes and muffins, but I loved this. I ate slices of it as is - no spread is required. It is good warm and cooled. This week's Wednesday with Donna Hay recipe is Chicken Spaghetti Salad, chosen by Kayte from p57 of Modern Classics Book I. 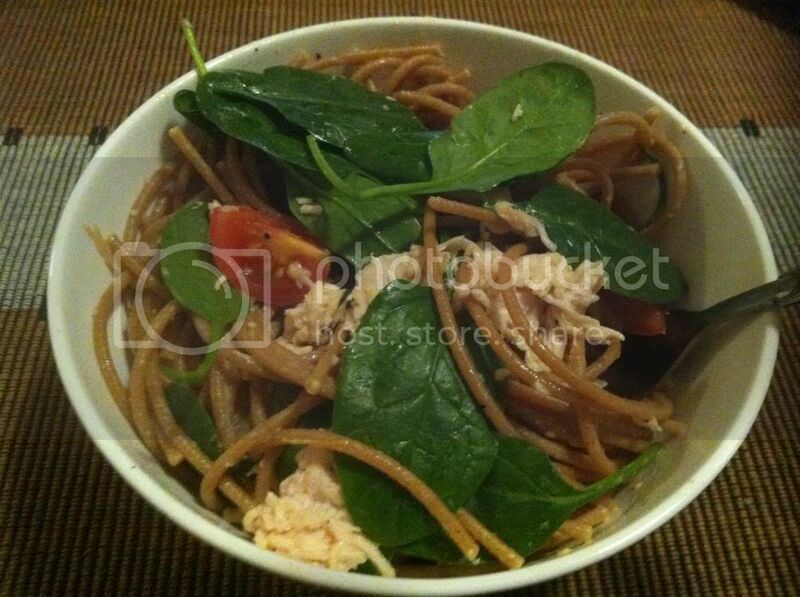 This salad is so simple but so good - shredded chicken breast, cherry tomatoes, baby spinach, spaghetti, egg, mustard, lemon juice, salt and pepper. 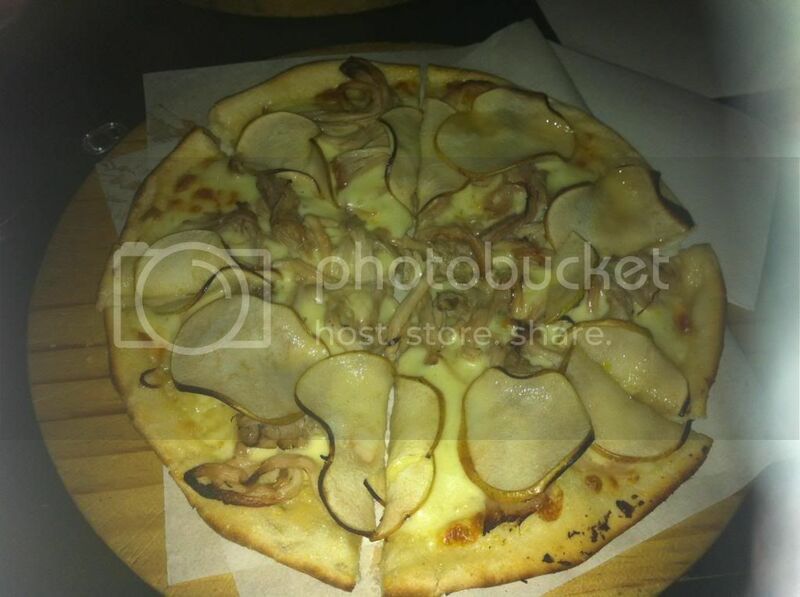 It is absolutely delicious - I could have this again. I have previously mentioned Share: The Cookbook That Celebrates Our Common Humanity, sales of which support Women for Women International. If you are looking for a cookbook that is both beautiful and has something for everyone, this is it, and by buying it, you are supporting a very worthy cause. Brown the chicken in the hot oil in a large, deep fry pan. Remove the chicken from the pan and set aside. Add the onion to the pan and cook until soft and browned. 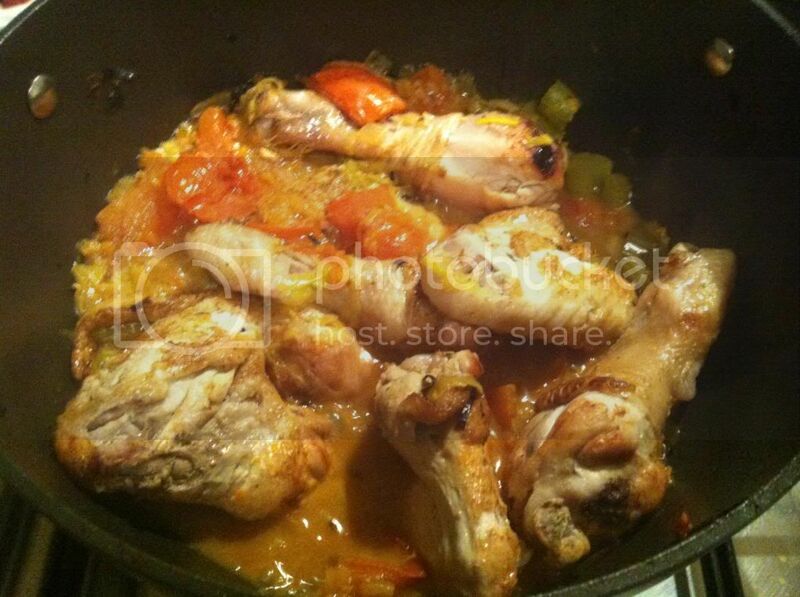 Return the chicken to the pan with the tomatoes, celery, chilli and salt and pepper to taste. Add the stock, bring the liquid to the boil, then reduce the heat and simmer, covering the pan, for 30-40 minutes until the chicken is cooked through. Serve the casserole over rice (or in my case, cous cous). 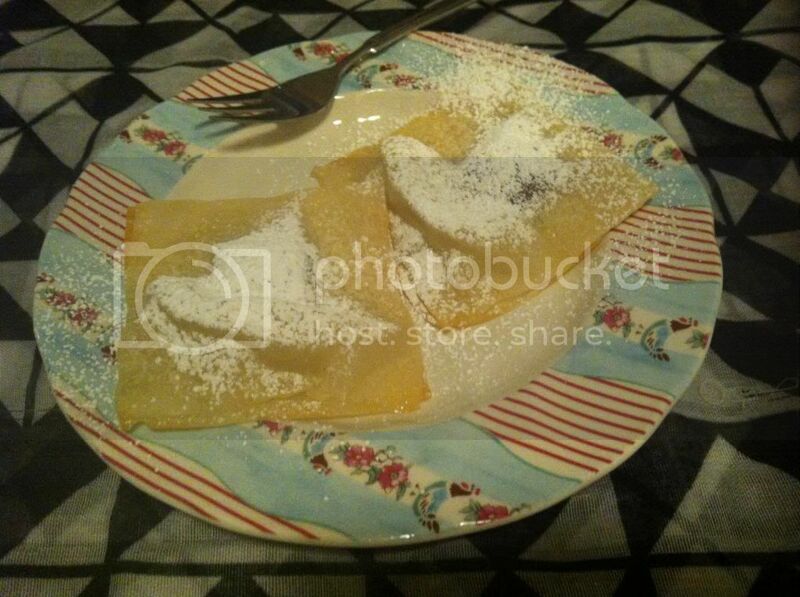 Life is full of surprises, and this week's French Fridays with Dorie recipe is no exception. We had to make Goat Cheese and Strawberry Tartine, which I imagined to be a tart, but is in fact, bread topped with goats cheese, strawberries and balsamic vinegar. Instead of baguette, I used apricot delight fruit loaf. I tried it with the bread both fresh and toasted, and loved it both ways. This truly was superb - it is so good that when I ran out of strawberries, I kept going with tinned peach slices instead, which is an equally delicious combination. 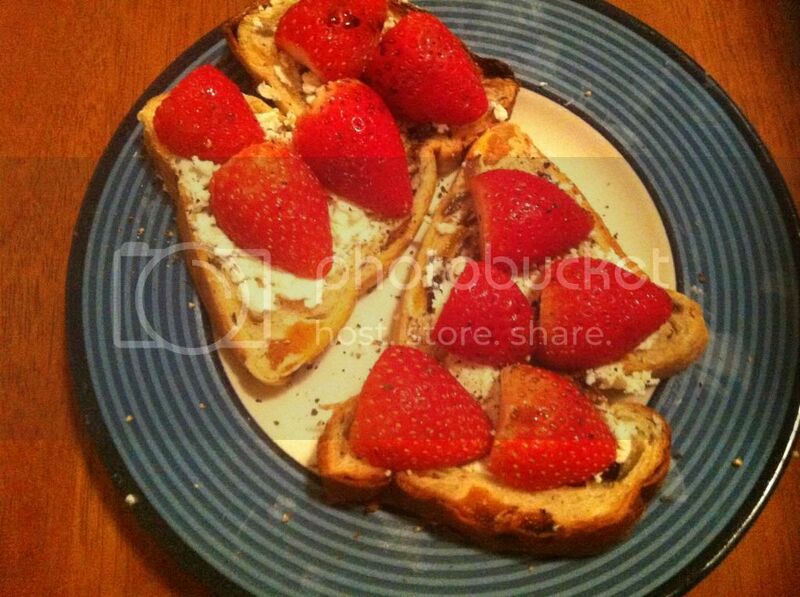 Who knew that goat cheese and strawberries on bread tasted fabulous? Dorie obviously, but I don't recall of anyone else ever suggesting such a thing. All I can say is try it- I loved it. To see what the other Dorie participants thought, visit the LYL section of the website. Do you like trying recipes where there is no photo and you have no idea how the dish will turn out? With the Internet, you can always browse for a photo of what you are about to make, but it doesn't always yield results. Baseema is a South Sudanese dessert that I had never heard of before, but I was curious about it after reading the recipe on p41 of Share: The Cookbook That Celebrates Our Common Humanity. According to the recipe, "baseema" means "delicious" - how could I resist? 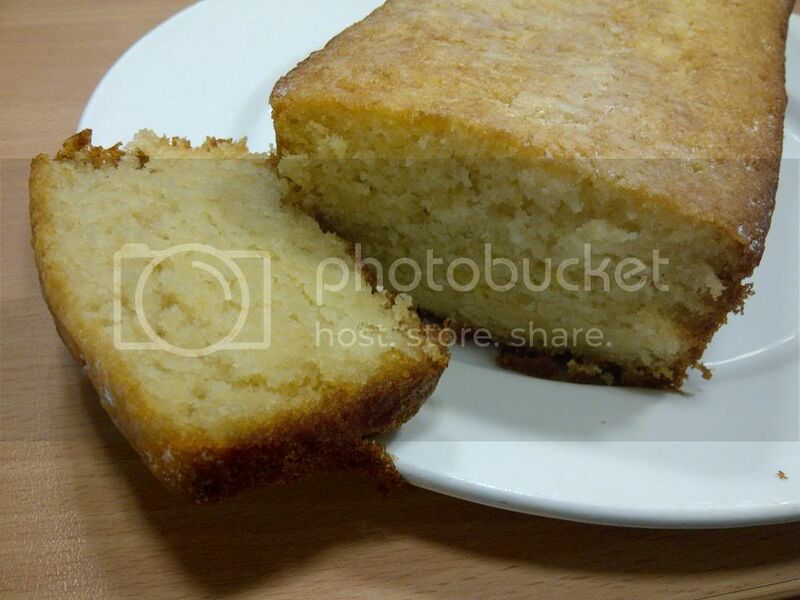 I did browse for a photo of Baseema so that I had some idea of what I was making, and the golden, fluffy looking cake that I found encouraged me. I was very pleased with the Baseema. There is no photo of it in Share, but with ingredients like yoghurt and coconut, I couldn't go wrong. The end result was as light and fluffy as these photos suggest, and Baseema tastes wonderful and moist without any frosting or other additions. Preheat your oven to 180 degrees Celsius, and grease and line a 23cm x 33cm cake tin. Beat together the eggs and icing sugar until light and frothy, then stir in the oil, yoghurt and vanilla. In another bowl, mix together the flour, baking powder and coconut. Fold these dry ingredients into the egg mixture, and pour the resulting batter into the prepared cake tin. Bake the baseema for 30-35 minutes or until cooked through. While the baseema is baking, put the sugar, lemon juice and water into a small saucepan, bring the mixture to the boil, then simmer for 5 minutes to thicken up the syrup. Pour the syrup over the baseema while it is still warm from the oven, and leave the syrup to soak in for a while before cutting the baseema into squares to serve. This week's Wednesday with Donna Hay is my pick. I went for quick and simple, and chose Bacon and Egg Pies from p158 of Off the Shelf. These pies taste delicious, and are achieved with minimal effort. To see what Kayte, Margaret and Chaya thought of these pies, visit their blogs tomorrow when it will be Wednesday their time. Two months ago, I had no idea what a Savarin was. Fast forward to now, and I have made two of them. My first effort was for Daring Bakers in April. Now I have made a Savarin again, this time for Baking with Julia. The Baking with Julia version of Savarin was much less of a production than the Daring Bakers version. Instead of six hours of rising time, there was just under an hour of rising time all up. The finished product was smaller, but was therefore easier to work with. Instead of soaking the cake in cooled syrup while the Savarin was hot, in this recipe, the hot syrup is spooned onto the cold cake until it can't hold any more fluid. I found that the Savarin was moister and spongier than the Daring Bakers version because it was smaller and therefore it took less syrup to saturate it. For the syrup, I added a tablespoon of Chambord to give it a slight raspberry flavour. Although the recipe called for whipped cream to fill the middle, I used the same crème patisserie as we used for the Daring Bakers version. 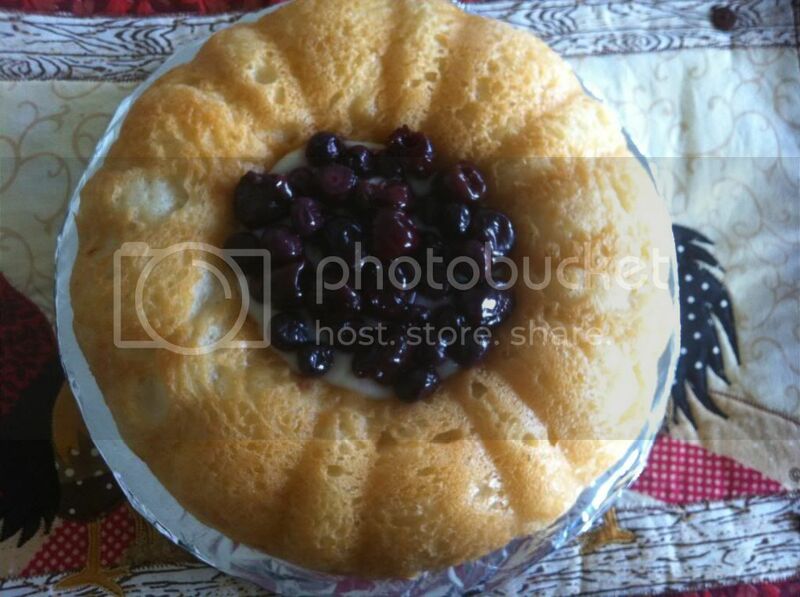 This time, I used blueberries and cherries to top the Savarin. While this Savarin is not on such a grand scale as the Daring Bakers version, I liked it better because it was much easier to make, and the Savarin itself was softer and moister because of its smaller volume versus the amount of syrup. I had dreaded making another Savarin so soon because I knew the amount of effort that went into the last one, but I needn't have feared it this time - I could have easily made the entire cake, filling and all, in an afternoon. I adore raspberries - any recipe that pops up in a magazine that contains raspberries has my attention. 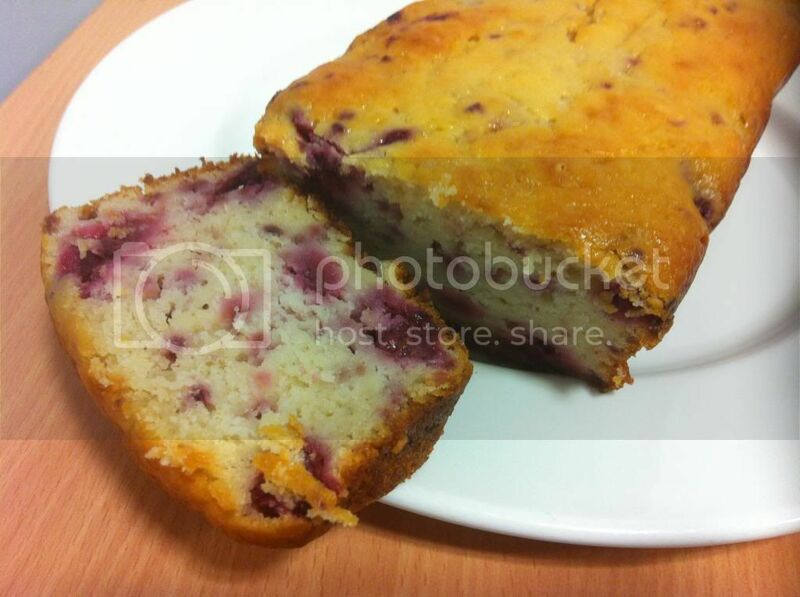 Accordingly, when I spied Donna Hay's recipe for raspberry yoghurt loaf, it was love at first sight. I found the recipe in Sunday Style (12 May 2013), but you can find it online here in blueberry form. What is not to love about this cake - it contains tangy yoghurt and gorgeous raspberries (the frozen variety so that you don't have to remortgage your house to make it). I think this would work well with cherries as well as other berries. 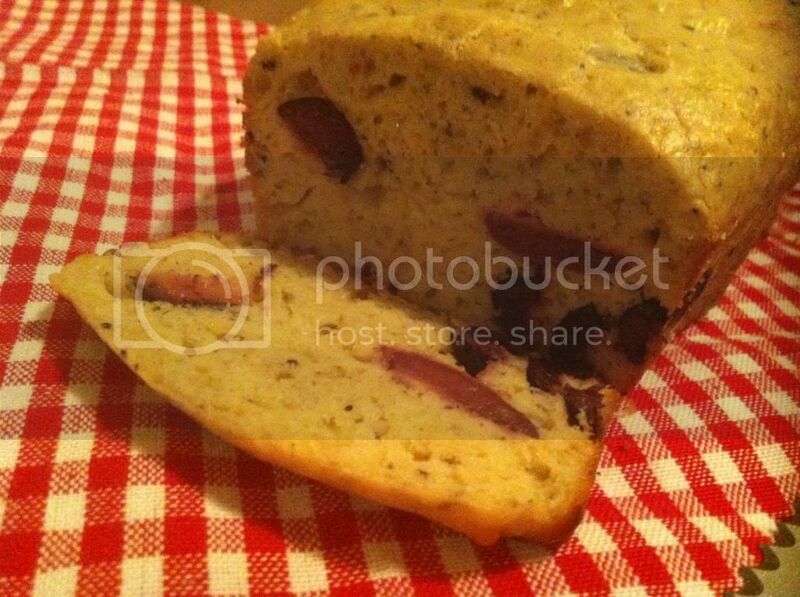 The cake itself is soft, moist and tangy - it is really easy to eat. If you love raspberries, do try this cake - it is a treat.